The natural tones of the Born Nectar make it a versatile and stylish choice. 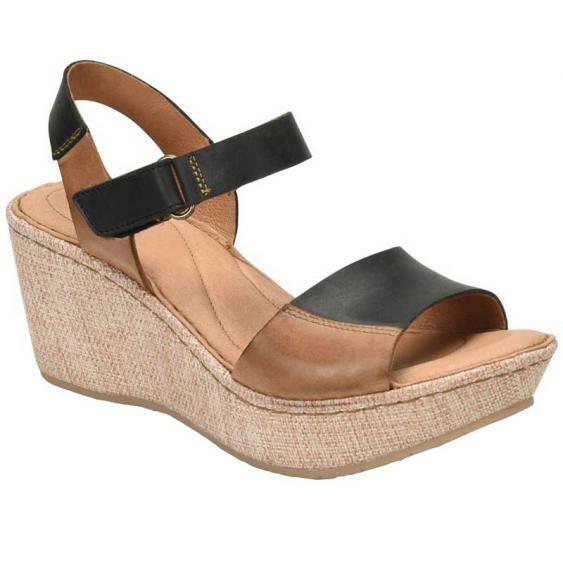 This wedge has an upper made of multi-colored leather with detail stitching, a basket weave wrapped wedge, and all the comfort you need in a shoe. An adjustable strap with hook and loop closure provides on/off ease and the soft leather linings wick moisture away from the foot. A liberally cushioned footbed keeps you going all day and extra padding at the arch gives you support. The lightweight PU outsole and 2 ¾” wedge of the Born Nectar provide plenty of stability while giving you a boost in both height and summer style. I found these shoes to run narrow. I wear a 7.5 and have average width feet. I ordered a 7 and was super disappointed when they felt too tight around the straps and my foot hung over the edge. I loved the color and they were super comfortable just seem to run narrow.